The Alpine Tundra, simply put is a tundra that’s in the mountains. This ecosystem is found in the high mountains, between 11,000 and 11,500 feet in elevation. Due to its elevation, strong frequent winds and cold temperature dominate the Alpine Tundra. It’s dry with more exposure to the sun and little precipitation. The soil is low in nutrients and the ground has a constant layer of permafrost. There are no trees in this ecosystem, or any tall plants for that matter. Much of the plant life of this ecosystem include cushion, flowering, and perennial plants - cushion plants being compact, cushiony, and tuft plants and perennial plants being long lasting and recurring plants. This data shows the female population of mountain goats in British Columbia from the year 1977 to 2009. The bold blue line on the graph depicts the the number of female mountain goats in each given year, while the soft blue line depicts the overall trend of the data that has been collected. No year reached a higher number of mountain goats than the first year of the collection of data and no year had an extreme increase or decrease from the previous year. Lasting from 1977 to 1978, 1988 to 1990, 1995 to 1996, and 2001 to 2003, the female goat population remained just about the same; while in other years, we see a noticeable change in the population. 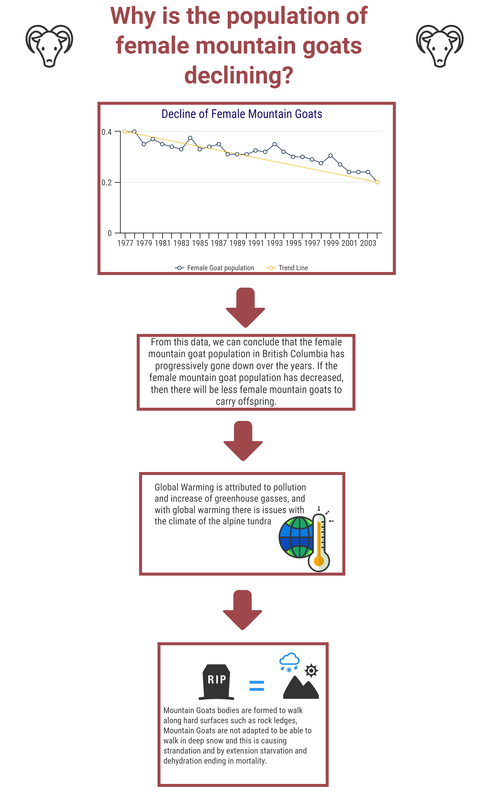 From this data, we can conclude that, the female mountain goat population in British Columbia has progressively gone down over the years. If the female mountain goat population has decreased, then there will be less female mountain goats to carry offspring. If there are less female mountain goats to carry offspring, then there will be less offspring and if there are less offspring, than the overall mountain goat population will see a decrease. If this trend in the female mountain goat population continues, over the course of approximately 63 years from when this data collection began, there would no longer be an female mountain goat population. Which would mean that around the year 2039 there would no longer be female mountain goats in British Columbia and therefore there would be no way for the overall mountain goat population to continue. Female Mountain Goats are vital to the alpine tundra surrounding. These goats are dying from harsh winters and hunting. Global Warming is causing the condensation of the polar ice caps, and carrying that water to other places, through precipitation, that do not typically have this weather. Mountain Goats bodies are formed to walk along hard surfaces such as rock ledges, Mountain Goats are not adapted to be able to walk in deep snow and this is causing strandation and by extension starvation and dehydration ending in mortality. Global Warming is attributed to pollution and increase of greenhouse gasses. This can be reduced by simple things like biking or walking instead of the carbon emissions of cars. As well as using reusable bags instead of petroleum filled plastic. 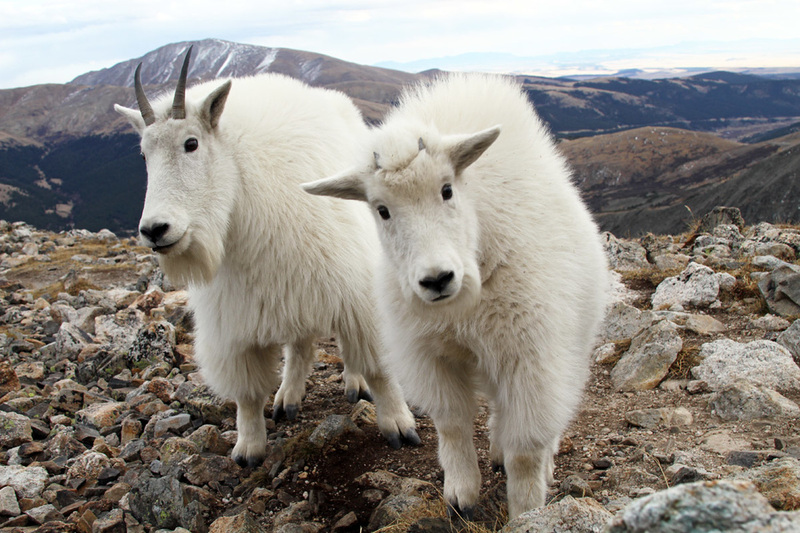 These mountain goats are a necessary organism in the Alpine Tundra and they need to be rescued from our parasitic actions.